So I’m a day late posting my usual weekly story time & craft. I’ve been away enjoying the mountains of Star Valley, Wyoming with my family and just returned last night. 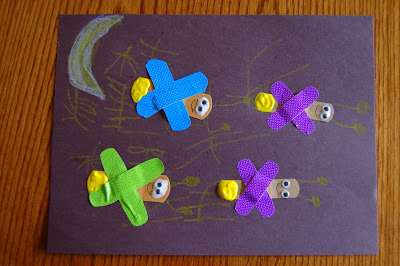 A couple weeks ago I saw the most adorable Firefly craft at No Time For Flashcards using Band-Aids and I knew I had to try it out with my kids. Luckily, I had the perfect book in mind to go along with it. Eric Carle’s stories are so creative and are a MUST for Preschool. Eric Carle describes his book “The Very Lonely Firefly is about belonging. We all want to belong to a group, a family, our own fellow creatures.” After talking about the meaning of the story we set out to make our own firefly families. Mine turned out differently than No Time For Flashcard’s simply because I couldn’t find yellow Band-Ads, but we made some adjustments and I am very pleased with our take on the fun craft. 1. 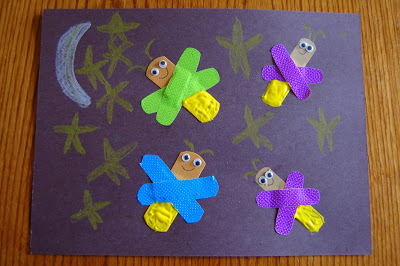 Draw a moon and stars on the left corner of your black sheet of construction paper. 2. 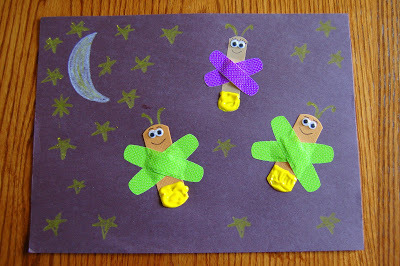 Place your regular Band-Aids on your paper to make the Firefly bodies. 3. 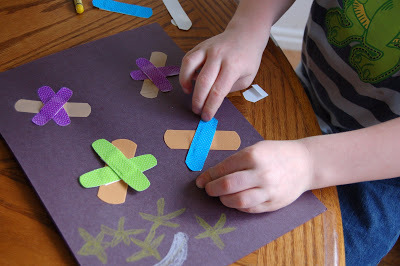 Take the colored Band-Aids and place them over your Band-Aids making an X to form the Firefly wings. 4. Dab some glue on the top of the Band-Aids and put the wiggly eyes on. 5. 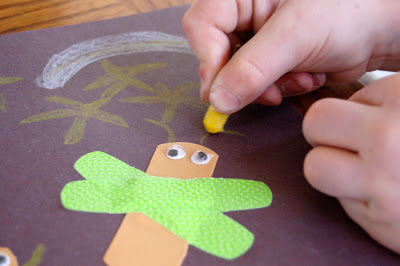 Use the yellow crayon to draw antennae on the Fireflies. We also filled in more stars around the Fireflies at this point but I didn’t take a picture of it. 6. Use the yellow puffy paint to paint the bottom of the Band-Aids to make them glowing. 7. You can be done at this point, but we decided to use a fine tip black marker to add some details to the face. You make the cutest crafts with your kids! I am LOVING it! Thank you for linking up again this week at the frog. As a mom of a toddler AND a kindergarten teacher, I LOVE this!!! It's JUST the kind of project I'm wanting to showcase!!! These are just darling I just love Eric Carle! My kids would get a kick out of this project, thanks for sharing! I am excited to be your 50th follower! Thanks so joining our Mingle With Us Blog Hop and Giveaway again. What a cute project! I'm the director of a preschool and will be passing this along to our teachers for the kids, thanks for sharing!! 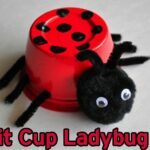 I am a former teacher and I love your cute projects! I am sharing them with my cousin who runs a preschool. I am your newest follower. I would love it if you came over to Greetings From the Asylum and checked me out! Thanks for sharing! Now I think I need to stock up on dollar store band aids. This is darling, I love the use of unconventional things for art! This is adorable!!! I can't wait to do this with my boys, they'll love it! So cute! And what kid doesn't love playing with bandaids! Those are just so cute. I love Eric Carle books. This is sooo cute! What a great art project for the kids! This is so fun and creative. I wonder if there are glow in the dark band aids out there. That would be so cute. Thanks for sharing at my art party last week. Hope you come back later today and share another idea. I WILL be featuring this tomorrow! Thanks so much for linking up for Share the Fun last Friday! I love crafty things too! My daughter loves playing with band aids, she goes crazy over them! coming thru from Link and Learn? Thank you for linking up your creative fun to The Sunday Showcase – hope to see you again this week! As soon as I saw this picture on Pinterest I immediately thought of this book to put the activity with! So glad I have found your blog! 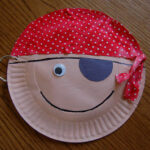 I do a book with a craft every Friday with my pre-school kiddos! Can't wait to search around your blog some more!